On Thursday, one of the faceless behemoths completed its desecration of a once-great giant of Bay Area radio, KGO-AM 810. For the last few months, Northern California media maven Rich Lieberman warned us that Cumulus Broadcasting was preparing to repeat its usual decimation of a media market once it completed swallowing up a handful of Bay Area stations, including some nationally-known powerhouses, KGO and KNBR. KGO-AM was an ABC (and later Disney) “O & O” (owned and operated affiliate), sharing the same address as KGO television, which Disney kept. Yes, ABC/Disney was also a big corporation, but it followed the time-honored management philosophy: if it ain’t broke, don’t fix it. KGO’s entire weekday line-up of talent got pink-slipped, except for Ronn Owens. 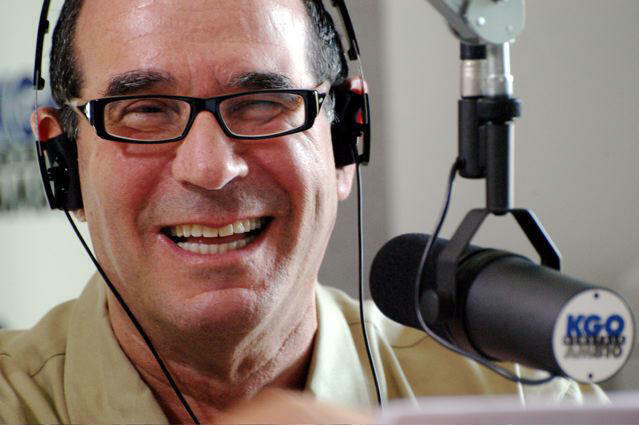 Even brandishing his Marconi Award like a cross wouldn’t have been enough to save him from these godless vampires; but years ago, Ronn’s good friend and protector, the former station manager/benevolent despot Mickey Luckoff, signed him to a “personal services” contract which was too expensive to buy out. It seems unfair to blame Ronn (and all the others who survived the chop); to look at them as corporate tools. But his gracelss defense of the format change might make the NAB regret giving Ronn his Marconi. That’s the same kind of thinking as the 60s burn-outs (the anti-everything-about-America-except-our-freedoms crowd) who co-opted the Occupy movement (and punctuate every sentence with “like” as if it was a comma). An organism’s first duty is to itself. To survive. That’s true whether it’s a plant or an animal, an individual or a corporation. Let’s put the blame where it belongs, on the politicians who gutted all the regulators like the FCC and FTC. Before “diversity” became a hot-button synonym for “minorities,” it meant freedom of choice. Nowadays the radio landscape in Dallas or San Francisco sounds just like it does in New York or Seattle, except maybe for the number of country stations. As much as some of us disliked Ray Taliaferro and his mumbling recitation of today’s Democratic Party talking points or Dr. Bill Wattenburg’s patronizing pronouncements from Mount Olympus, at least they were different from the homogenized pap we got from the syndicated meat-grinder. 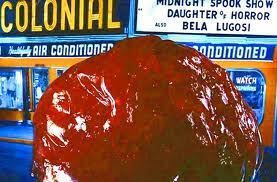 At one time, the FCC and the FTC kept corporations from swallowing up media outlets like that red gelatinous nightmare we saw in The Blob. By enervating those regulators, it became impossible for independents and small chains to fight off being absorbed by the aggregators like Cumulous. There's lots of blame to go around on both sides of the political spectrum. 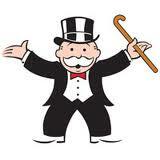 The Democrats say they're on the side of the little man, and I agree, but he's the little man with the handlebar moustache on the Monopoly board. We’ve got the best politicians money can buy. Sixty years ago, Humphrey Bogart played a crusading newspaper editor in Deadline, U.S.A. He and his publisher, Ethel Barrymore, tried to fight off a take-over bid fueled by her greedy children who were anxious to cash in by selling off to conglomerate. “The Day” got sold and that city lost an independent voice. It was a different medium, but it's the same story. I’ve been reading a lot about Facebook campaigns and proposed advertiser boycotts, but these seldom succeed. Outrage rarely lasts longer as it takes to type the screed. 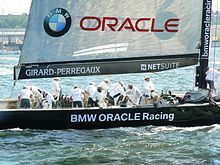 Larry Ellison to the rescue? Who knows, maybe Larry Ellison might do it. He’s just egotistical enough to want expand his Oracle brand to broadcasting. No doubt you must have heard about and perhaps seen yesterday’s horrific accident at Las Vegas Motor Speedway which killed two-time Indy 500 winner Dan Wheldon. It was both horrifying and mesmerizing. Within a few minutes it must have been certain to the folks in the booth that Wheldon (a colleague who had worked with some of the producers and technical personnel earlier this season for 3 races), was dead. The producer and director wisely chose not to show replays after the first 15 minutes and they did not show the wrecked chassis of his car, which track officials wisely covered immediately. The clip begins onboard Wheldon’s car. “GO LOW! GO LOW! GO LOW!” Wheldon’s spotter screamed. The car takes flight at the bottom of the track (0:15) and bursts into flame as it hits the catch-fence in front of the O'Reilly Auto Parts sign. At 0:26 a barely audible gasp, "He's dead." It must have been the hardest two hours of their careers for Marty Reid, Eddie Cheever, and Scott Goodyear, the men in the ABC/ESPN booth. 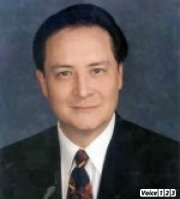 They knew the obvious had occurred and any doubts they might have had evaporated as the minutes interminably crawled by and Indy officials were not forthcoming with details of his treatment. Normally, when a driver gets injured, within a few minutes there’ll be either a full rundown of his injuries if they're minor or they'll at least say if he's awake and talking. The silence must have echoed in their ears. Still, they could not speculate or allow their emotions to get the best of them. The official news would not come until someone reached Wheldon’s parents in England to gently break the news. The cars were driving on a 1.5 mile high-banked oval track in Las Vegas, built for NASCAR. Stock cars have fenders and quarter-panels covering the wheels. If you graze another car, usually you don’t send him out of control. But open wheel cars are very different. When wheels touch or one wheel is grazed by the front wing of another, it’s disastrous. Las Vegas was known as one of the smoothest, best paved tracks, which lulled the drivers into driving “flat,” meaning they never lifted off the accelerator. The initial crash occurred about a quarter mile ahead of him, but when you’re travelling at 220 MPH, that means your car moves forward 321 feet per second. That’s more than a whole football field and one end zone. “GO LOW! GO LOW! GO LOW!” his spotter screamed, but it was too late. Wheldon could not take evasive action. Another car came down in front of him and that’s when his left front wheel went over the back of that car, launching Wheldon’s car airborne, tumbling like a child’s toy into what’s called the “catch-fence,” which is nothing more than normal chain-link fencing three feet off the ground meant to keep flying debris from injuring spectators, above the SAFER barriers, which are engineered to absorb shock. Wheldon’s cockpit hit the bottom of the SAFER (Steel And Foam Energy Reduction) barrier and continued into the catch-fence, erupting in flames as it happened. It's unlikely he survived the impact. 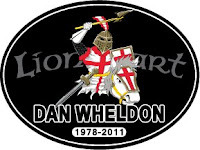 Wheldon was universally loved and respected in the garage. He was always known as the fellow who had an extra moment to talk to a fan, pose for apicture, sign an autograph. Countless anecdotes were repeated yesterday from fans who said he knelt down to talk with their child and didn’t just talk, he asked questions and listened. Just two weeks ago, a young friend, Matt Weaver, who writes about NASCAR and Formula 1, covered his first Indy race. He walked through the paddock area and chatted with Wheldon, who was warm, kind, and gracious. They weren't “the big shot series champion” and “the newly-minted journalist;” they were two guys who loved racing. The race was red-flagged for nearly two hours. After the parade of tear-filled and ashen faces left the driver's meeting, the inevitable announcement was made. Wheldon’s fellow drivers chose to drive a five-lap tribute to him, during which his number 77 was the only number displayed atop the scoring pylon. Perhaps the saddest ironies are that even though Wheldon had won an Indy Championship and had twice won the crown jewel, the Indy 500, first in 2005 and then again this May, he still had no full-time sponsor going into this, the season's finale. Because he was such a good driver, he was asked to test the new, safer 2012 Indy cars. The adoption of that car will come one season too late for Dan Wheldon. On Sunday morning, just hours before his death, he signed a contract to drive next season for Andretti-Greene racing, run by Mario’s son, Michael, who was his team owner when Wheldon won his first Indy 500. He was going to take Danica Patrick’s vacated seat. Last week was my birthday. Because most of my family was out of town, all merriment was postponed. My sister Karen called to find out how I celebrated my birthday. She was surprised by my response. I went to the library and took out a book I'd been saving for my birthday, The Prince of Frogtown , by Rick Bragg. Most people are surprised to learn that I enjoy reading more than almost anything else I can talk about in polite company. I'll read nearly anything: graffiti, cereal boxes, fine print on User Agreements, anything. I'll spend hours surfing the web learning about architecture, French Impressionist painters, Ernie Kovacs, nearly anything. I tell people I'm like a magpie. A magpie is a bird which will pick up tiny objects and bring them back to its nest. People who live in the country know better than to leave a window open without a screen, because a magpie will see an earring gleaming in the sun and fly in to steal it. I was one of the earliest adopters of the Internet, and I understood it was the greatest invention of the 20th Century. I had not known how quickly it would dominate the publishing world, sucking away readers from newspapers and magazines the way a factory trawler wipes the ocean bottom clean. Had I known, I would not have been so overjoyed. Although I spend hours on my iMac surfing the web, I have yet to fully embrace the world of portables including handhelds. I have a Twitter account, but I'm not a self-absorbed Jersey Shore denizen who believes everyone is interested in what I just ate or where I got my latest tattoo. I spent a good deal of my working life in bookstores and newsstands. I loved the smell of the old oil-based printer's ink when I cut open a fresh bundle of newspapers. (I don't miss getting my fingers dirty.) I love opening a fresh newspaper no one else has touched, turning pages and folding them over, and then folding them in half again, lengthwise, so I can read it the way commuters do on the subway. I came to believe some of the best writing was ephemeral; printed on cheap paper that yellowed and got brittle after a few hours in the sun. Once the Internet took hold, I found I was only buying a newspaper to do the crosswords and sudoku. I'd read all the stories before I went to sleep and I got the latest before I hit the streets. I wonder if future generations will know the intoxication I feel when I enter a used bookstore and take a deep breath of the intoxicating aroma of mildewing paper and decades-old tobacco smoke. In a lot of ways, the Internet is wonderful. But this is yet another case of the frivolous cacaphony of nonsense created by the vox populi. A lot of what I see on the Internet is like this. The small "d" democracy of the Internet gives license to anyone with a keyboard and a loud opinion, without the necessary common sense to go along with it. Stop for a second... How do you think people get to be top of their profession in a hard science such as nuclear physics? By spending their days playing golf or watching Star Trek episodes? They work hard studying their discipline and we should respect that. We were also losing business because our customers would have to interrupt their movie after 55 minutes to run out and feed their parking meter or risk a $40 ticket. Our city was using parking citations as a major revenue source, consequently they had parking officers constantly patrolling our neighborhood hunting for violations. It only takes one forty-buck parking citation for a customer to decide to drive half an hour to a mall theatre with newer, stadium seating, a dozen different features playing, and best of all, free parking so you don’t have to risk a parking ticket. Even if you’re careful, it means frequently checking your watch and then interrupting your movie (and the people around you) to go out, feed the meter and come back. Meanwhile you miss five or ten minutes of your feature. Yeah, I know the NCAA® registered the name, March Madness®. Let the ’em sue me for using it without their permission. This not a comprehensive list. There are others designed specifically for handheld devices, and I saw at least three which could be downloaded at iTunes or the Apple App store. Nearly every sports radio station, sports website, offshore gambling casino has their own. All contests require registration, so I suggest signing up early. You probably want to submit your brackets early to prevent getting locked out by heavy traffic on Thursday morning. Most contests permit you to start a bracket and save it without submitting, so you can do it in parts. The New York Times Bracket Contest. Coke Zero NCAA Bracket Challenge sponsored by Chili‘s. This information presented for entertainment only. No gambling, please. Once in a while you meet someone so thoroughly steeped in douchebaggery that it takes your breath away. I don’t mean someone who is truly evil or malicious; those draw no admiration from me. But you very rarely meet someone who is so obnoxious even skunks won’t cross his path out of professional courtesy. Marshall looks mild-mannered behind his Clark Kent glasses, but when you look past the glasses and peer into his soul, you find such a vast and cavernous void that it could double as a yodeling venue. We started off on a slightly off note. He’s a tech guy, a specialist who installs and maintains networks in your home and business. I’ve known enough of these guys to mostly like them. They are used to being patient with their clients; pretending not to discover that the equipment was unplugged or a connection was loose. I was discussing an issue with some web code with someone who did a little web design. Marshall heard two sentences, and right away he had to tell me why I was having that problem. Never mind that he was never a professional web designer. He knew better. One afternoon, not long after I received my new business cards, I was passing them out. I had included a calendar on the back, and most people immediately commented how handy that was and how they would hold onto the card, which was why I chose that feature. FIRST HERE ON BLOGGER. SpinDoctor500Blog and AZ Republic sports writer Michael Knight was interviewing Trevor Bayne before Sunday’s race and young Bayne offered him a hot lap around Phoenix International Raceway. Read his account here. “Why don’t we take off our seatbelts? It’d be a little more fun!” Bayne chuckled. Trevor Bayne gave himself one spectacular birthday present. Starting from the 16th row in only his second NASCAR Sprint Cup race, at 20 years and 1 day, Bayne became the youngest Daytona 500 winner. Young Bayne was asked to hold out his hand prior to the race. “Are you nervous?” he was asked. Trevor held his hand steady and said, “No, sir.” During the coverage, Fox broadcaster and former Daytona 500 winner Darrell Waltrip, a lay preacher, had nothing but praise for the polite young man, mentioning more than once that Bayne had led his team in private prayer after the public invocation which preceded the race. The other day I was in a meeting for a civic organization I’ve joined. Although I joined and participate in their activities, the jury is still out as to whether I will continue with them, but that’s another story, although I touch on it briefly here. A group of us were in a department meeting. Sitting in with us was an academic, a bonafide top authority in his discipline, who had done his Ph.D. on the field we’re in. He was here to do a follow-up to see how the environment had changed in the ensuing five years. We’d all approved his presence and we spoke frankly as we always do.